Your guide to what’s coming up next in the marketing world. 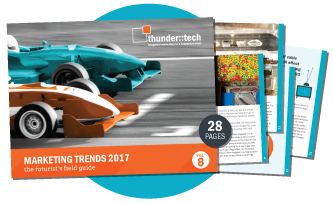 The eighth annual edition of the thunder::tech TRENDS book is packed with actionable ideas and insight for marketers, business owners or students of the industry. You probably already have a treasure trove of great information about your customers in your systems right now… the trick is unlocking it and leveraging it to your advantage. Customers are using their voices to search the internet, but are they finding your brand? Voice search is fundamentally changing the way online search functions, and its popularity is growing. Learn more about how this emerging technology will impact your business in 2017 and beyond. Quizzes, assessments and calculators used to be just fun time wasters. But now smart brands are using them to connect with their customers in new and exciting ways. Today's customers consume over 100 million hours of video every day! Learn how to build a multimedia library and strategically leverage that content to boost customer engagement and strengthen the bottom line. Information—Today’s customers are better informed than ever before. Options—There are significantly fewer barriers to switching brands in the current marketplace. Competition—Your competitors have the resources and technology to quickly overcome nearly any innovation you introduce. Learn more about Customer Experience (CX) and how it offers the only competitive advantage that really matters. The digital advertising landscape—including online ads and cable TV—is in a constant state of flux. Learn more about big changes on the horizon that will dramatically impact your ad dollars. Change creates obstacles, but also supplies opportunity. Anyone who thinks e-commerce is just for B2C brands is behind the times. Nearly 52% of B2B buyers report that they will conduct half of their purchases online within three years. Make sure you have the facts about this seismic shift in how B2B companies are doing business.